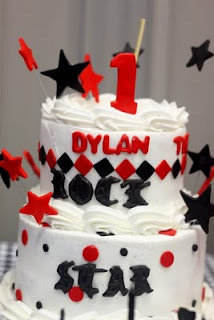 A few weeks ago I was asked to make a cake for one of my new mommy friend's little boy's FIRST birthday. 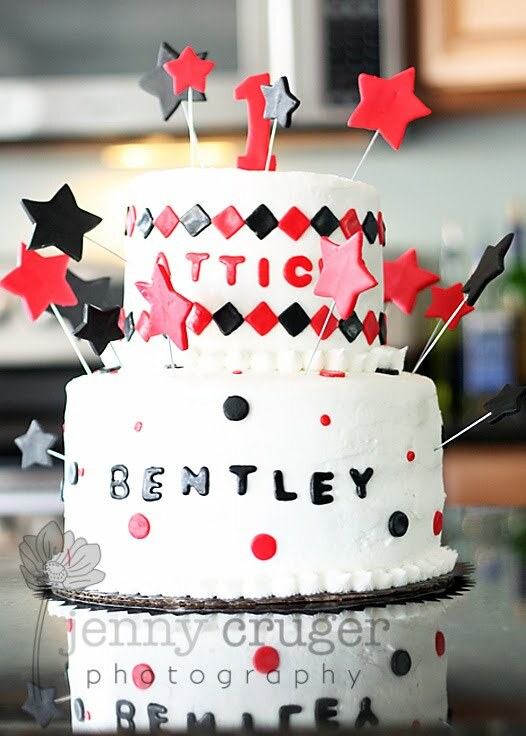 She had decided on a "Rock Star" Theme and wanted a cake inspired by this one she saw online at Kara's Party Ideas. What an honor! The cake features a lot of geometric shapes, which if you don't know by now, are my thing. I used my "Buttercream with out the butter" icing for a true white. I'm not sure why the top tier settled in a little caddywhompas, but I'm trying not to beat myself up too much about it. I mean, I used a level on all sides before I stacked them! What else can a girl do?? I think it turned out ok!